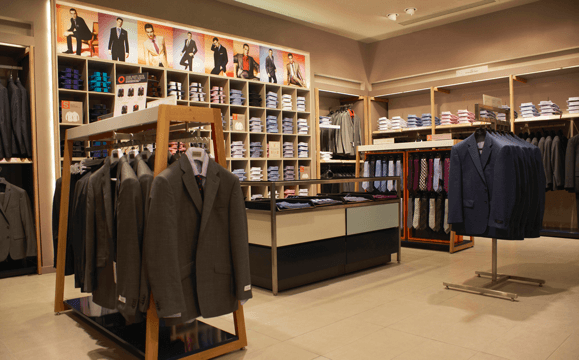 Men’s formalwear retailer Moss Bros Group knows how much impact looking good can make – so for their flagship Moss store at Canary Wharf there was no one better ‘suited’ to the job than Johnson Tiles and Norcros Adhesives. The Moss store offers a new concept in suit shopping. As it was the first branch of the retail chain to combine all its services under one roof, it was also the launchpad for Moss Bespoke, a new high-tech tailoring service offering clients made-to-measure work and formal wear. Tailors input customer measurements and requirements into iPads, which are then sent direct to the manufacturers for delivery in six to eight weeks. With such a high concept vision, it was vital that this was reflected in the look and feel of the store. To give the high-end yet durable effect needed, Johnson Tiles used two colours of its Arcade porcelain floor tiles in 600 x 300 size. As a unique feature, a proportion of the tiles were water-jet cut to 600 x 150, creating a tile feature design in the middle of the shopfloor. The project, which totalled over 200m² of tiling, giving Moss the reassurance of a lifetime guarantee on the whole installation. For their flagship Moss store at Canary Wharf there was no one better ‘suited’ to the job than Johnson Tiles and Norcros Adhesives.